For the month of April, the Northeast Harbor Library will host an exhibit of photographs by local photographer Anne Wetzel. 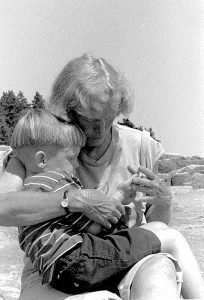 The exhibition, entitled “A Celebration of Friendship,” is photographs taken of Bettina Dudley and family at Webb Pond in Eastbrook, Maine, starting in the summer of 1999. When Anne arrived on MDI in 1998, she ran into a familiar face for which she had no name. When Anne politely introduced herself, the “familiar face” said, “Of course. You knew me as Bettina Corning at Camp Merestead when we were 15.” These spirited portraits of a family’s summer life in Maine are a celebration of that renewed friendship. They shine with Wetzel’s warmth and humanity as a photographer, and will especially delight those who knew, and now miss, Bettina Dudley. There will be a closing reception for the exhibit on Friday, April 27th from 5 to 7. All are welcome to attend, the reception is open to the public. The exhibit may be viewed during the library’s operating hours, though the room is occasionally booked for private use. Call ahead to inquire about availability at 207 276 3333. You may contact Kate Young at kyoung@nehlibrary.org with any questions.